Fair warning - this is going to be a bit shorter than usual. I nodded off a bit in the first half (thanks, insomnia! ), and even when awake I was not watching with the usual level of detail that I try to put into this. At any rate, it was nice to see us thoroughly dismantle a club that's an even bigger dumpster fire than we've been lately. 1. Speaking of, I have no idea how much longer Slaven Bilic is going to stay in that job, but I reckon it's not going to be super long at this rate. 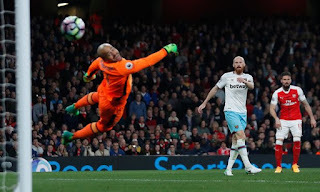 I couldn't quite work out what formation West Ham were playing in, but the end result was that Andy Carroll was often out wide - you know, where he could do the least possible damage to us. It didn't help their cause that the few set pieces they had were met with atrocious deliveries, but all in all they kept their best weapon effectively holstered for the whole time he was on. Also, as quiet as he was, I don't understand subbing him off. Weird decision-making all around. 2. However, it should be said that Shkrodan Mustafi and Gabriel both had excellent games. They weren't needed often, but they were on point when they were. Even though much of this game was an extended attack-vs-defense training exercise, neither one recklessly rushed forward to join in the attack at bad moments, and both had several excellent interceptions and tackles. 3. In that vein, the whole team was much better in terms of their spacing and positional play this time around. My theory is that replacing Francis Coquelin with Mohamed Elneny made us far more balanced in all areas of the pitch. Elneny was proficient in both halves of the field, and he seemed to have a knack for always being in the right place. I continue to insist that there's a good player in Le Coq somewhere, but until someone can harness his talents into the right areas of the pitch, Elneny looks like he might be the better option. 4. 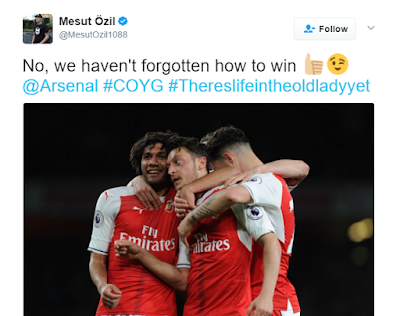 Mesut Ozil today: Fire on the pitch, pure shade on Twitter. 5. The German and Alexis Sanchez looked back to their best in the second half, or at least close to it. I hate to pile on the guy, but I think part of it is down to the fact that they got to play in front of a more settled and competent midfield behind them. Some people don't get that football is a team game to the extent that one cog in the wheel misfiring can affect most or all of the other ones directly because of it. Anyway, these two drove us forward today, and the Hammers - who had defended so well in the first half - had no answer for it. The first goal was a long cross/shot from Ozil that eluded everyone and snuck inside Darren Randolph's far post. The Irish keeper's going to get slated for it by the usual suspects who know nothing about keeping, but watch a replay and check out some excellent dark arts from Alexis. At precisely the right moment, the Chilean snuck just enough in front of Randolph's sight line to put him off. There are few things you hate more as a keeper, because there's so littler you can do about it. 6. The second goal, on the other hand, was pure breathtaking majesty. The backheel from Alexis into the run of Ozil was crazy, and then Ozil's return left the Hammers backline for dead. All of it was done at pace, too. That, my friends, is what more of our attacks need to look like. Speed kills. 7. Admittedly, I had expressed my worries on Twitter before the match about how Emiliano Martinez would fare in between the sticks today. The ongoing travails of Joel Robles at Everton shows how bad most clubs have it when their No. 2 custodian has to play, let alone the No. 3. It also makes the complaints about David Ospina look even more brain-dead than they are, but I digress. Anyway, the Argentine did a lot to dispel the memories in my mind of the 7-5 League Cup game against Reading a few years back, where he did his best impersonation of a newborn foal. He didn't have a lot to do, but that is a point in his favor. It can be difficult for even the top goalkeepers to maintain their focus when the ball hasn't made it into your half in ages. But, he made one save late on that was a hundred times harder than it looked, with the ball swerving wickedly at almost the last second. He got two strong hands to it with proper rebound control, and the danger passed. Well done, my son. But, and I'm already seeing this nonsense on Twitter, let's not get ahead of ourselves. I'm not buying that he is better than either of our other two more experienced keepers, at least not yet. If the other two remain injured, Emi gets a run in the team and he keeps playing like this? I'll go in with an open mind. Stop acting like he's Lev Yashin after one game, though. It's not a good look. 8. Right around the time where our *third* stonewall penalty of the match was not given by Martin Atkinson, I kind of got a little heated. No, I'm not sure how someone can be both motherless and fatherless...what can I say, I was a little upset. Regardless, Atkinson was unbelievably awful. Completely sub-professional. The only thing I could gather is that he went in with the idea in mind that we're a bunch of diving southern softies, and hence almost anything is embellishment on our part as opposed to agricultural hacking in the penalty area. Poor old Nacho Monreal was eviscerated twice, with no joy either time. I don't remember the specifics of the third but it was just as bad. The reason I lean towards "incompetent" as opposed to "corrupt" is that he got a few things wrong for our benefit, too. There was the aforementioned sly interference from Alexis on our first goal, and Mustafi was indescribably lucky to not get a card for a wild two-footed lunge in the second half. He sort of got the ball but any referee will tell you that intent matters too. I was saying to a friend that perhaps the English game would be able to attract and retain better refereeing talent if there were rugby-style rules against dissent and abuse. One to ponder, that. 9. Ollie Giroud came on as a sub, and a few nanoseconds later Randolph was picking the ball out of his net after a fantastic curling strike from the Frenchman. Someone remind me why he's not playing, like, way more often? 10. There were other good signs from our subs, as well. It was good to see Aaron Ramsey back on the pitch after a long injury layoff, and Giroud's goal was created by a barnstorming run from Alex Oxlade-Chamberlain. Having more options can never hurt, especially if it makes it more likely that Coquelin finds himself on the bench for a while. Palace and Middlesbrough are next. SIX POINTS, PLEASE.